A teardrop-design 1938 Talbot-Lago Figonio et Falaschi won European Best of Show and a 1929 Stutz Lancefield took American Best of Show. 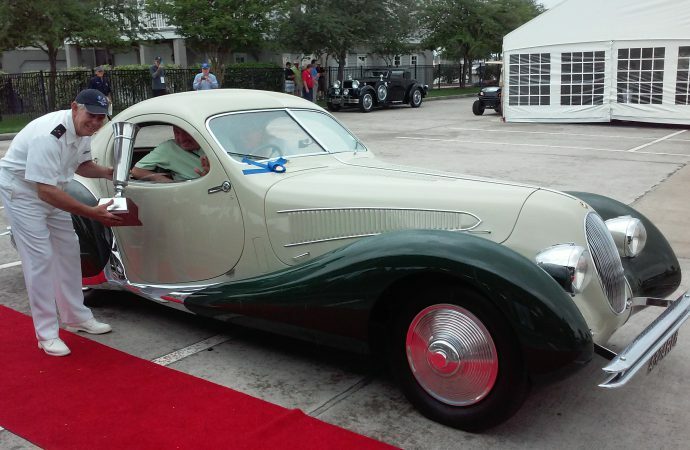 A teardrop-design 1938 Talbot-Lago Figonio et Falaschi won European Best of Show and a 1929 Stutz Lancefield took American Best of Show at the 21st annual Keels and Wheels Concours d’Elegance held April 23-24 at the Lakewood Yacht Club in Seabrook, Texas. Other significant award winners included the People’s Choice trophy to a 1934 Rolls-Royce Phantom II Continental two-seater convertible. Earning the Margaret Dunning Award was a 1930 Packard 733 while a 1902 Oldsmobile Curved Dash took the Tom Timmins Award and the Chairman’s Choice went to a 1951 Talbot-Lago T26 Grand Sport. Other highlights of the show included tours of a 1958 U.S. Naval Academy training boat, test drives and showings of several new vehicles, such as the 2017 Lincoln Continental. Children were able to participate in the “Kids Build a Boat” event, with the finished boat raffled in a drawing. Aaron Shelby, grandson of Carroll Shelby, was in attendance at the show. The Keels and Wheels concours benefited the Boys and Girls Harbor charity that aims to give care to children experiencing family hardships or neglect. The Boys and Girls Harbor remains the benefiting charity for the next Keels and Wheels Concours, slated for May 6-7, 2017 at the Lakewood Yacht Club.